Asteroid Threat - Solar System Planets And Moons Section. 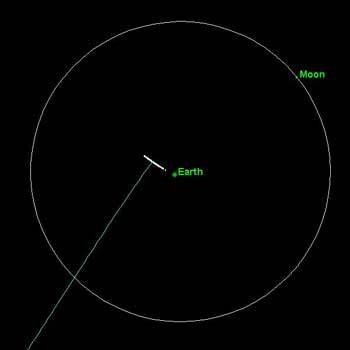 2004 Astronomers have now ruled out the possibility that asteroid 2004 MN4 will strike the Earth in April 2029. scientists from the Spacewatch Observatory near Tuscon, Arizona searched back through older observations to find some images of 2004 MN4 that were captured in March, 2004. This gave them enough data to recalculate the asteroid's path, and see that it doesn't pose a threat to the planet. The passage of the asteroid by the Earth in 2029 alters its subsequent trajectory and expands the asteroid's position uncertainty region (i.e., the line of white dots increases in extent) so the asteroid's subsequent motion is less certain than it was prior to the 2029 close Earth approach. However, our current risk analysis for 2004 MN4 indicates that no subsequent Earth encounters in the 21st century are of any concern.